The Eppley Institute for Parks and Public Lands now offers its national-award-winning workshops to individual agencies, park units, and other organizations. Our workshops are tailored to meet your organization’s goals and objectives and are delivered on-site in your location. Arranging for an Eppley Institute on-site workshop will ensure that your organization’s staff, volunteers, and stakeholders benefit from cutting-edge learning and development opportunities in an interactive, in-person format. Whether your location is a short drive away, on the other side of the globe, or anywhere in between, the Eppley Institute can customize any of the on-site workshops below to fit your time, budget, and goals. The workshops listed below are the most popular on-site workshops offered by the Institute. Establishing a workshop location, length, number of attendees, and content focus is easy. The process begins with an email or phone call to the Eppley Institute. 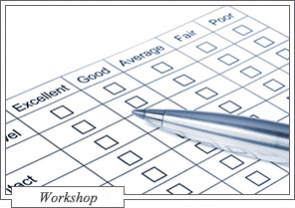 Effective evaluation goes further than participant feedback, and the Quality Matters approach offers a manageable template for getting usable information about programming. Participants will examine eight features of an online education program offered by their agency. Criterion-based measures will then provide participants with the tools they need to focus program improvement.